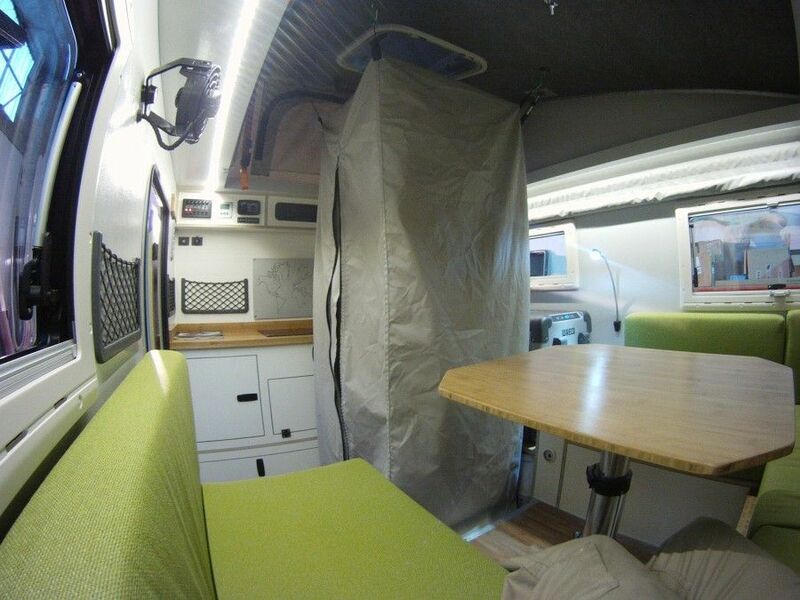 This page shows a few approaches for adding showers to DIY van conversion or RVs starting with really simple (but functional) designs and working up to the full blown RV shower with pressurized plumbing and a water heater. Also, a few outside the box ideas for showers and cleaning up at the end. They now make nice little kits for doing an outside shower that come with a recessed mounting pan, faucets, and the hose and shower nozzle. 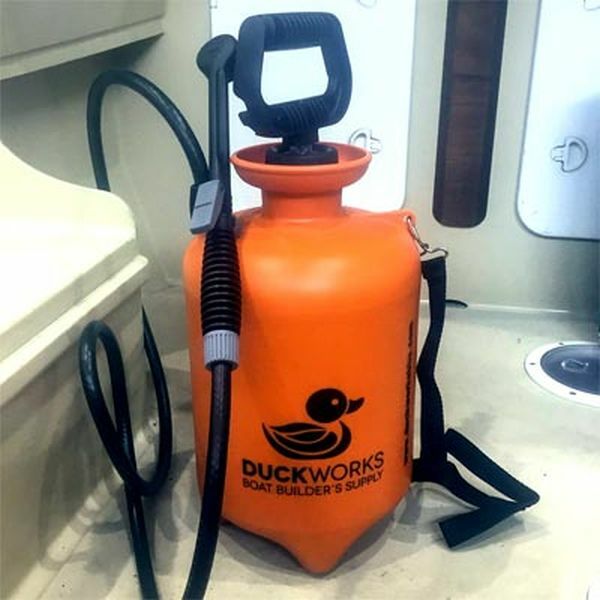 You can mount this at a handy place on the outside of the van and use it for outside showers of you or the dog. You could plumb it with just cold water from the fresh water tank if you are the hardy type, but if you want hot water you will have to add a water heater. There are a variety of tanked and tankless small water heaters for RVs for propane, electric or diesel fuel. 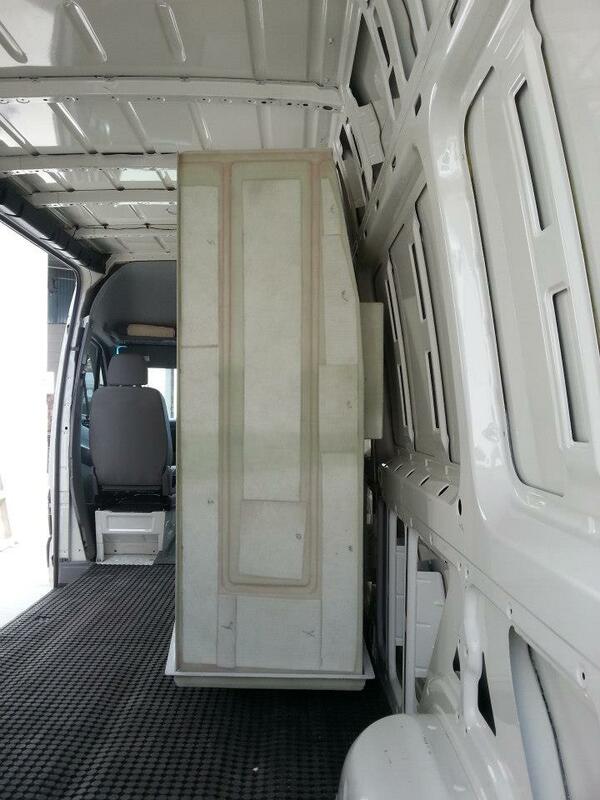 For van conversions there would be the possibility of mounting one of these units on the back of the van, and then using the two back doors in the open position to support a fabric visibility shield to provide a bit of privacy for the outside shower. 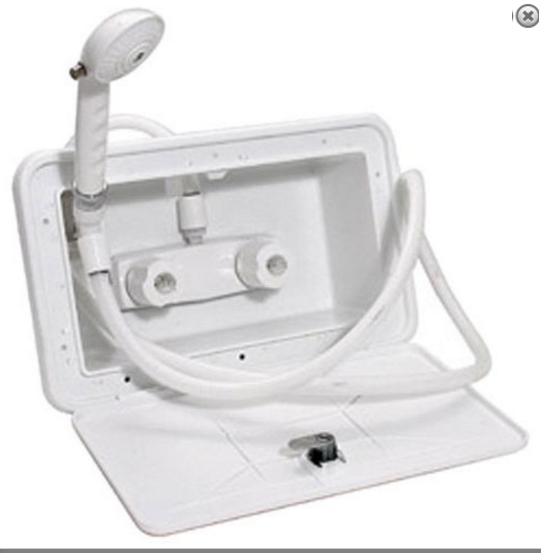 One could also mount one of these inside the van on a wall for a permanent or non-permanent inside shower (see below). 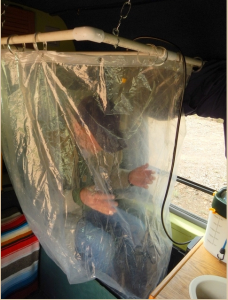 There are some designs for setting up a shower inside an RV on an as needed basis. The advantage of this is that you don’t have to dedicate floor space for the shower — you can just use an open area of the van floor and put the shower up only when you want to use it. 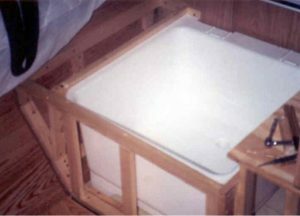 These generally consist of a plastic basin that you stand in while showering, and shower curtain to that hangs from a pipe frame attached to the ceiling, and a container filled with heated water for the shower. See the Rick the van man shower described below for one way to do the container based water system for the shower. Nice collapsible shower for a van conversion. The shower basin stowed away. 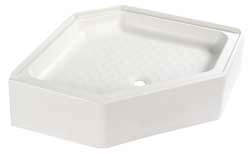 Another option for the shower pan would be to use the circular water catch trays that they sell to put under household hot water heaters that are made to catch water leaking from a hot water heater. This approach of setting the shower up only when you need it is clearly not the most convenient solution for taking a shower, but it works, does not take up any floor space, and is inexpensive and fairly simple to implement. Shower built into a dinette area. This is Rick the Van Man’s shower design. Its really simple, but its functional and provides the things you would expect out of a shower. Its entirely homemade and is made from inexpensive materials you can buy at the hardware/lumber yard. The shower is a small enclosure that also holds the PortaPotty style toilet. The shower pan and the shower walls are all made from readily available waterproof floor and wall coverings. Caulking is used to seal all the joints and make them waterproof. Not sure how well this will hold up over the long haul, but its very simple and inexpensive even if it might require some maintenance attention to keep it waterproof once in a while. The water supply for the shower is a plastic container of about 3 gallons that is filled with heated water and then carried to the shower. A small submersible self priming pump is placed in the container, and the outlet tube from the pump runs via a flex tube over to the shower head — this about 5 ft of tubing from the pump to the shower is is the entire plumbing system for the shower. There is a wall mounted switch that turns the pump on/off so that you can easily turn the shower off and on while in it to conserve water. 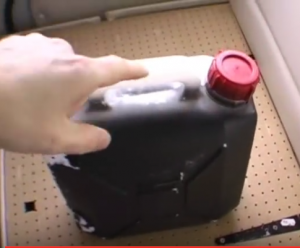 The water container is painted black on the outside and can be left out in the sun to heat up on a sunny day — otherwise the water can be heated in a kettle on the stove and pored into the container. Have to say, I really like the simplicity of the plumbing on Ricks’s system. 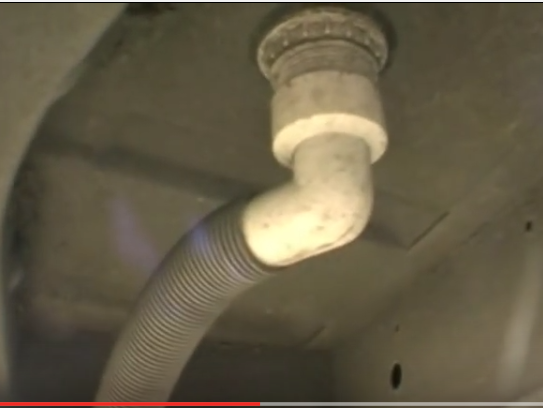 The drain for the shower just goes right through the van floor and then via a flexible drain pipe to the grey water tank. 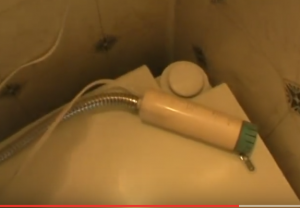 No trap on Rick’s setup, but the shower drain does have a rubber plug that probably prevents any smells from the grey water tank. The shower floor is flat, but Rick just parks on a slight slope so that the shower pan slopes toward the drain. 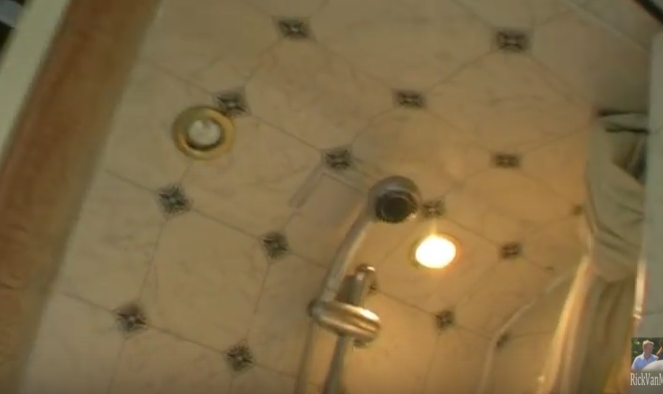 This is about as simple and cheap and easy a way to do a permanent interior shower as I have seen — it appears to function quite well. Rick has a number of YouTube videos on his van conversion (and other subjects) which are well worth watching. A full up RV shower requires a shower pan and shower enclosure, a shower door/curtain, plumbing to the water supply system, shower valves and a the shower nozzle, and a means to heat the water for the shower. You also have to set aside floor space that is dedicated to the shower, although the toilet is often located in the same enclosure. You can buy commercial RV shower pans and shower enclosures — for example at RVPartsCountry… and Dyers RV Parts… and PPLMotorHomes… and others. There are even versions with small bath tub shower combinations. Shower going into van conversion. Their advice is to make the shower enclosure the first thing to go in. 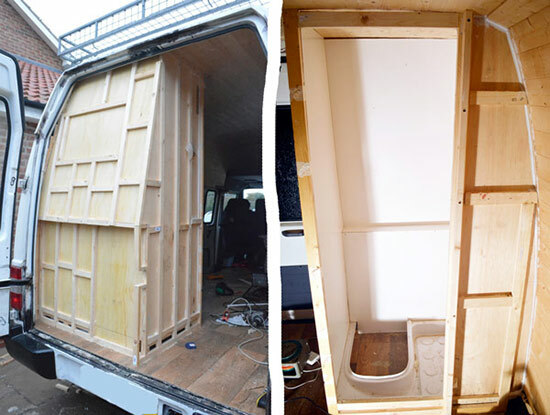 This is a detailed account from the Van Dog Traveller site of building a shower in an RV using a commercial shower pan and waterproof wallboard walls installed on wood studs. 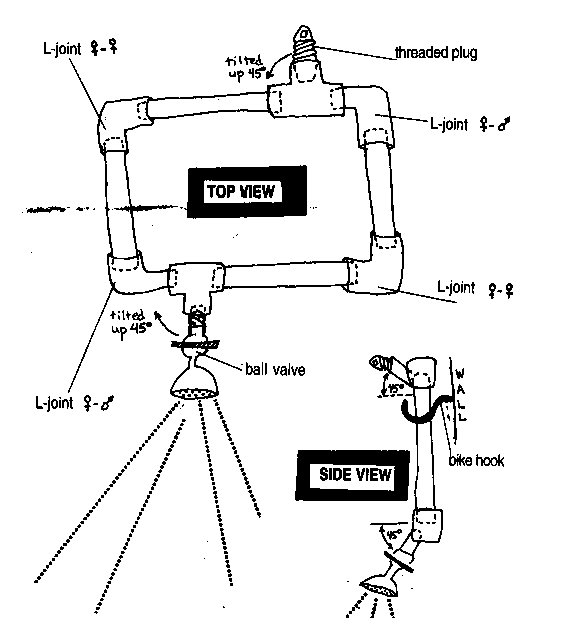 It also shows details on installing a cassette toilet in the shower. Lots of good detail. DIY shower build for camper van conversion. All of this is certainly doable and a lot of conversions do include full up showers, but it is a fair bit of work, and I’d have a look at some of the simpler solutions on this page and make sure that the extra work and loss of floor space is worth it in your situation. One fact to be aware of is that in a lot of commercial RV’s the shower ends up being used so little as a shower that it ends up being dedicated to storage. 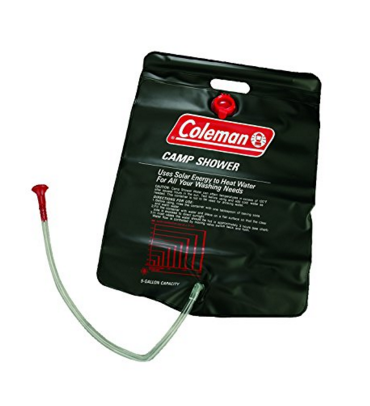 The Shower In A Bag is a simple commercial product that pumps water from a container of hot water to a shower head. Solar Bag Showers just consist of a black plastic bag that you fill with water and place in the sun to heat up. To use it, you hang it up high enough for the the water to flow out of the bag to the shower nozzle. In good sun, they are effective. For days that are cool and/or windy, these bags might benefit from 1) insulating the back side to reduce heat loss (maybe just set the bag on a piece of insulation or even a folded up blanket), and 2) adding a layer of glazing over the sun side — this could just be a layer of clear poly film that is supported off the shower bag by about an inch. These two things should improve the efficiency on cold and windy days by quite a bit. These bag showers are not made for frequent use. 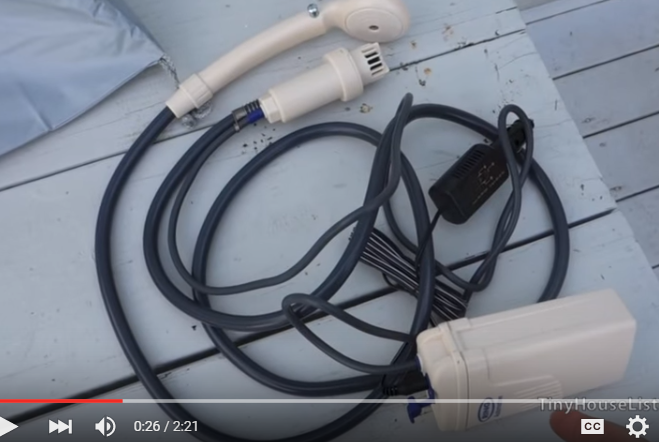 Another solar shower that uses a pump up sprayer, and that gets good reviews. 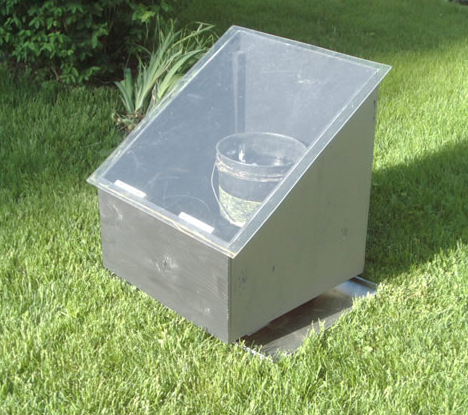 You could also take something like this 5 gallon black bucket solar water heater design and modify it into a solar shower by adding a tap and nozzle at the bottom. The enclosure and glazing arrangement could be made into a design that folds flat. The advantage of this over the bag ones is that the glazed housing makes it heat up faster and it would still be able to heat water on cool days. This is also a great simple solar water heater to have around for power outage emergencies. A more efficient and durable setup for solar heating shower water. 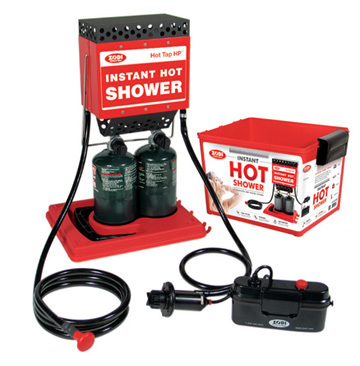 There are several commercial products aimed at heating water for a shower. Zodi makes some simple and portable water heaters for showers — some work with the small 1 lb propane cans… This is an on-demand heater, so it heats the water as you use it. They also make shower heaters that use a 20 lb propane tank for fuel. Zodi portable shower water heater. 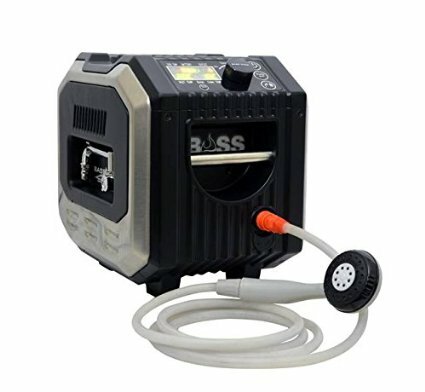 The Base Camp from Mr Heater is self contained shower water heater works from a couple D cells and a 1 lb propane cylinder… This is an on-demand heater, so it heats the water as you use it. 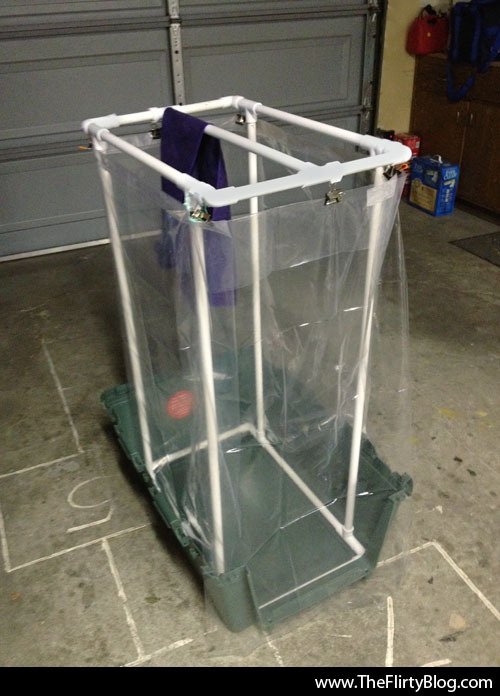 Zodi also sells a tent like shower enclosure for outside. 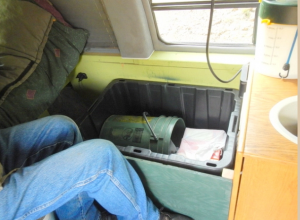 Base camp water heater uses 1 lb propane cylinder and battery for pump. Some gas stations operate “Travel Centers” that cater to truckers and RVers sell showers — one example is the Pilot and Flying J stations. From what I hear they are very nice showers. You don’t have to be a professional truck driver to use these showers. About $12. If you don’t want to give up space to a shower in your conversion, you can get clean with a sponge bath. Mother Earth News has a good sponge bath article… The author of the article has used this method for years with no conventional shower and it works fine.